A big man presence that can muck and grind and play hard nosed hockey. Gives my team some much needed toughness with the ability to score that is underrated. 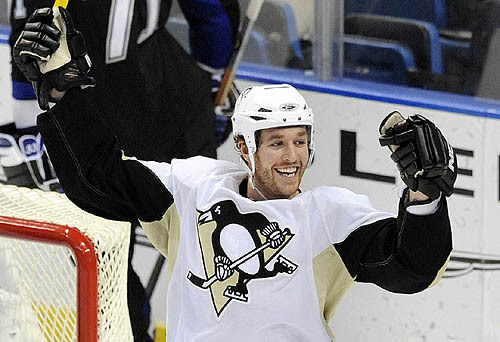 A consistent 20 goal scorer with the Penguins is a great role player to have on the team. You really aren't gonna let me put him on a line with his own father...? You're a homewrecker. I believe in strong centers and I believe in strong defensive players as well - in a depth role in this case. Missing out on Schock and Staal, I'll take a comparable player here that can play both center and right wing that scored a lot of points at ES it seems and logged a lot of PK time in his time here - also received a bit of early Selke (when the award was purer) recognition. Probably never should have dropped this far. 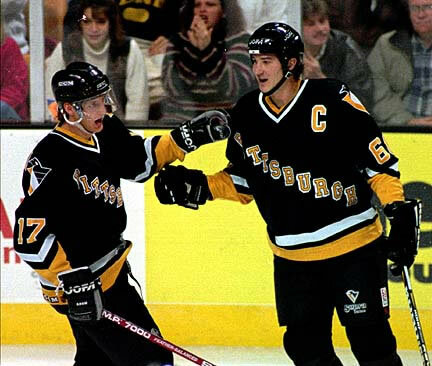 Appeared in 5 All-Star games (1 representing the Penguins), member of US Hockey Hall of Fame, had a heavy shot and, unlike Sergei Zubov, liked to use it. Still hate the trade, but all in all Hatcher had 3 fine seasons with the Pens. 45 G, 95 A in 140 GP. His subsequent trade was one of the many salary dumps the Pens were forced to do in the years to come. For three years, Kevin Hatcher was the anchor on the Penguins' blue line, putting in more ice time, performing more duties than anyone on the roster. And in the time it takes to tee up a slap shot, he was gone. "The first thing that comes to mind is that it's like a death in the family," Coach Kevin Constantine said yesterday, minutes after telling Hatcher he had been traded to the New York Rangers for defenseman Peter Popovic. "I don't know how else to feel. You spend two-plus years working with a person, and he does so much for you. Then, in a five-minute time period, you've got to say goodbye." Good pick Gaucho. I was going back and forth between him and Malone. I figured whichever I picked the other would be gone by my next pick. I made him the 47th pick of the draft, so sounds about right. I'm certainly delighted to have him on my 2nd pairing. Gaucho wrote: I made him the 47th pick of the draft, so sounds about right. I'm certainly delighted to have him on my 2nd pairing. I think we've reached the point where guys are going to start modeling their teams. Is the third line going to be a defensive unit or a puck possession line? Is the forth line going to be grinders (giggity) or specialty players? Draft a capable backup or get a fighter? In his last season with the Pens (1980-1981) he was 3rd in the NHL in games, 4th in wins, and 3rd in minutes. He was also first in goals against.. ouch. Almost led the Pens to a monstrous upset of the Islanders in 1980-1981. Was a starter for two playoff years, where the Pens lost both best of 5 series 3-2. Pretty tough pick here for me. I had Millen and three other goalies and there was just not that much that separates them IMO in their time with the Penguins. I wound up choosing Millen due to his age and the fact he got a heavier workload than most of the others. All right. My router went out there for a second. I could go through the stats, but it doesn't do Trottier justice. A HHOF mainly due to his time with the NY Islanders dynasty of the early 80s, Trottier was brought in to help the Pens win. 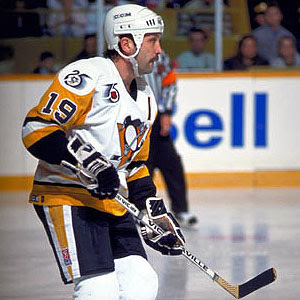 He did that, providing strong defensive play and leadership helping the Pens win back to back Cups in the 90s. Trottier also played in the 1992 All Star Game (commissioner's selection). Trottier gives me the prototypical shut down center. His statistical prime was over by the time he was with the Pens, which is fine for my team. Thanks Rylan. Yeah, I'm still skeptical of Millen, but with what's left, there isn't much left to take starter wise. I wanted to get Trottier from the beginning, and having Lemieux - Lang - Trottier down the middle should provide me with some tough match ups for the rest of you guys. Now it's just filling up with role players and I need to get tougher on D (no shocker there if you look what I have haha). Millen was the undrafted goalie I was referring to earlier. Gaucho wrote: Millen was the undrafted goalie I was referring to earlier. I actually had another post all ready to go for another goalie, but ultimately decided Millen was a better choice. I figured I needed to get a goalie at this point, but that was by the toughest pick I had to make so far. I had another name in mind, but I am not well versed about teams pre-1980 really. Anything after that and I at least have my feet wet enough to know what's going on. Re: Millen. As I was asked about his game a bit before...Athletic, old-school stand-up style. Locker room favorite, fan favorite. Right-handed catcher. Chance taker. Pure standup. Read the story on Millen: lost by the Penguins because Baz Bastien went on vacation and was never reached. Additionally, this was also not who I had in mind for the best goalie available after Wregget. But perhaps a case can be made. I have a feeling I know who Mikey has in mind... interested to so if that'll be the case when he comes up. The Sandman was a real superpest, who would first use his stick, mouth, and elbow to get under your skin, and then made you pay on the PP when you retaliated. Which is exactly what you would do sooner or later. Just ask Dave Brown. 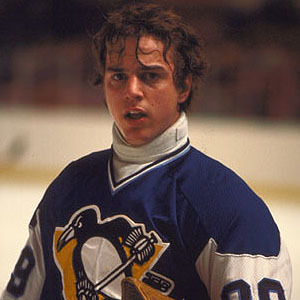 Sandstrom played parts of four seasons for the Pens, recording 71 goals and 84 assists in 172 games. Last edited by Gaucho on Sun Dec 09, 2012 5:28 pm, edited 1 time in total. what do the rosters look like so far?